Find the best that Vancouver has to offer all under one roof. Browse our list of top hotels, restaurants, bars and nightlife, and things to do. We hope you have a comfortable thirst quenching delicious and friendly visit. 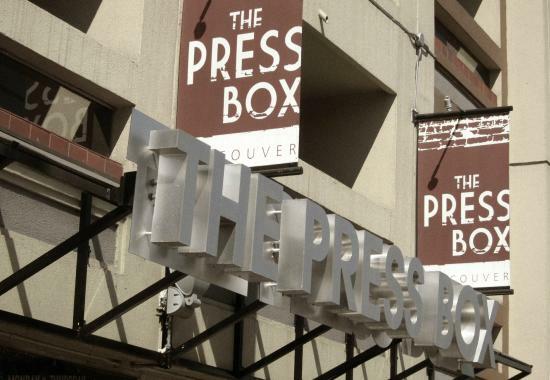 From the moment you step INSIDE the Box , you become part of the magic and history of Old Hockey Corner where 1000's of CONCERT goers , HOCKEY Fans , Horse racing enthusiasts , thirsty travelers, PNE & Hotel guests have gone before. We hope you come HUNGRY because our immaculate kitchen staff is cooking with LOVE and your service team will give you the celebrity treatment because Press box is Home of the EVERYDAY Celebrity We hope you come thirsty, Press Box has stocked it's shelves and fridges with a fresh cold selection of DRAFTS, Bottled Local & Imported Beers, Lagers & ales as well as fresh juices , energy drinks and coffee /tea service. But most of all we hope YOU enjoy your experience and get back to the BOX soon.